TO DATE the Moxi Digeo UI is the best by far and in my opinion should start to show up on those stupid Home Theatre PC’s instead of Media Center. Thank you, Ben. Interesting suggestion. Results from Engadget’s What Would Jobs Do contest. Google has three new widgets for Mac users: a quick blogging tool (I’m using it to post this), a Gmail inbox widget, and a search history. Missing from the blooger tool is a quick way to insert links. That makes it less than wonderful. But it is fast and convenient. Ack! I have only three images on the blog and they all feature Bush. Check me into rehab, please. Any post that includes the words “Feh!” and “Framing” is going to get my attention. When the topic concerns the nature (socially and generationally, not technologically) of the Internet and how to nurture its best aspects, it will draw me in. I’m sure to be distracted by commerce and my day job before joining this conversation in any useful way. But, at least I’ve pointed to it. It’s the least I can do—and on most days, sadly, the most I can do. 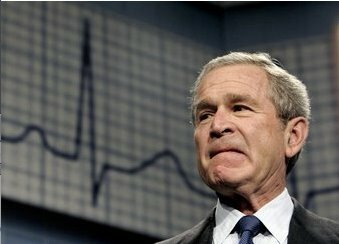 Bush makes a new personal low in job approval ratings. He’s below all recent presidents but one. Nixon’s the one. For those who don’t follow the family feuds…Bill O’Reilly of Fox Snooze has posted a petition to the overlords of MSNBC to replace Keith Olbermann with Phil O’Donahue. OK. Back at ya’ Loofa Man. Here’s a petition to Roger Ailes, Satrap of the Fox Yap Traps to can Bill for the aforementioned Phil. I signed. Will you?